There are many different types of moving boxes out there. Each type should be used in accordance with its design to make sure that your valuables are save while in transit. On this site you will find a lot of useful information how to pack things and what type of cardboard removal boxes are available. 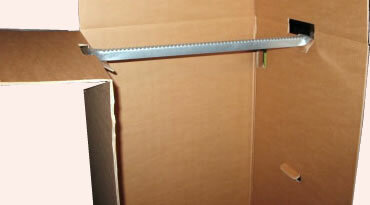 Whether you are moving a house or an office you can use the same kind of boxes. 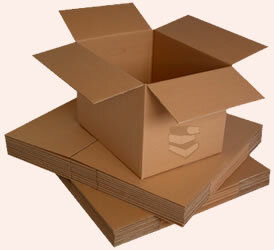 Book boxes - are used to pack books, magazines, newspapers, documents or paper for printing. Please remember that paper is very heavy. A few books, magazines and a couple of printing paper rims may weigh 30kg or even more. That's why the boxes that should be used to pack books are relatively smaller than standard cartons and much stronger. They are ideal for shipping to Australia, France or just a UK delivery. We recommend that you use at least double sided boxes with the following dimensions: Length: from 45 to 50 cm, Depth: from 30 to 35 cm and Height: from 28 to 33 cm. Off course you can use bigger box however if you fill it up it could fall apart during the journey, your belongings could get damaged or even get lost. Also for health and safety reasons both you and removal companies should not lift more then 25kg without any special equipment. It is very easy and quick to hurt your back but it will take a long time to recover. Book cartons are also suitable for moving DVD's, old vinyl records, small pictures. Imagine that you have a lot of things on your head regarding your move. You do not even have a time for a cap of tea. Everything you do you tray to make as quick as possible to save some time. The wardrobe cartons will be perfect for you. If you decide to use them you will note hove to fold up all your cloths but instead you can simply take them and hang in the wardrobe box. Once you have moved you will be able to take them out of the box and put back in to your cupboard within minutes. You will save yourself a lot of time because nothing will get crumpled too.